First and foremost, I'm a writer and translator. I write fiction, I wrote some video games and for video games, I write long and complicated posts on forums, heck, there was a time I would've written virtually anything if the price and hours was right. For living, I translate books. At night I create a huge retrofuturistic S-F novels with a tabletop games project on the side, hoping for fame, glory and penny. I'm a Culture Studies major, interested in (surprise!) culture and pop-culture, intertextuality, history and multimedia stuff. I also love classic 'gas guzzler' cars - muscle cars, pony cars, lowriders, hot rods - and the car Kustom Kulture. I'm also an AFoL with rather low budget and big ambitions and a B.A.S. - Brick Acquisition Syndrome. I entered the Dark Age in 2004 and came out of it in 2013. I love Creator and Technic sets and build mostly cars, planes and helicopters. I also use LDD, mostly to create models for my project. As an AFoL I'm not ashamed of my reborn passion for Lego and don't mind BROOMing on the table or SWOOSHing in the air... I shall also mention those sudden episodes of nearly psychotic rejoicing over newly announced sets. 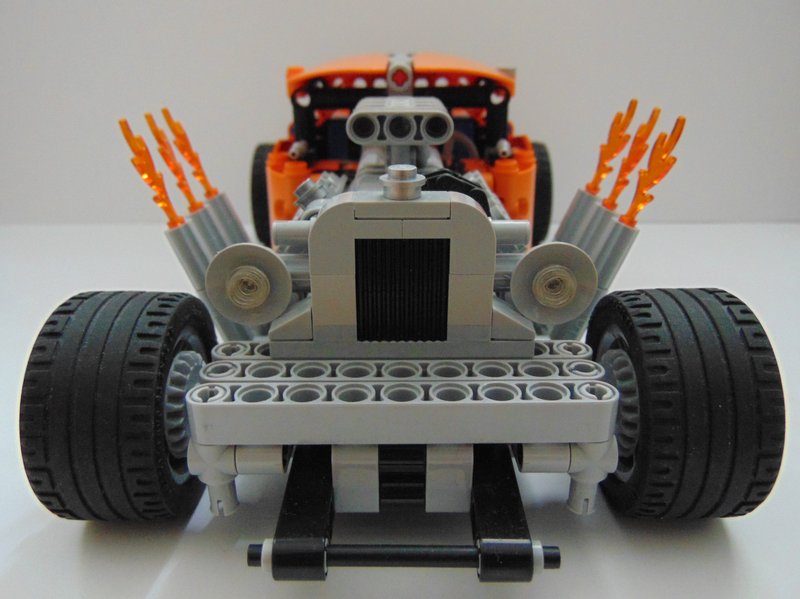 The Lightning Rod (42050 C-Model) An ominous dragster with huge rear wheels and powerful V8. Ready to commence the rake stance dance. The Hob Rod (Redux) The front half - mean. The rear half - business. The whole car means business. RAISE HOB. Belly Tank Speeder "No.6" - 42059 C-Model Salt flats are all that matters when gas guzzling. Turn that salt into mist, now! Immo Bravo is one of TheShellFace (Sean)'s favorite builders!